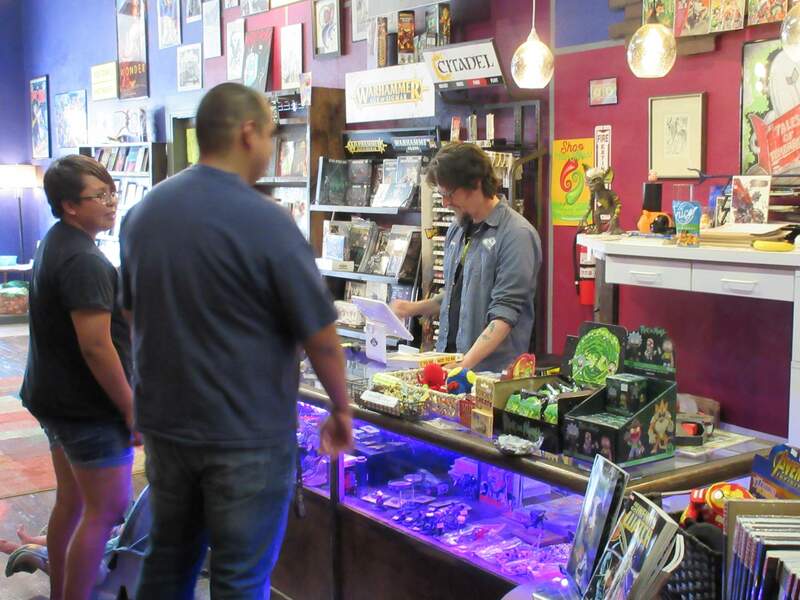 Tales of Tomorrow owner Steve Clark, right, assists customers with a purchase at the comic book shop in Farmington. The store opened in November of last year. New monthly comics line the walls of Tales of Tomorrow while back issues are organized on a table toward the center of the store. 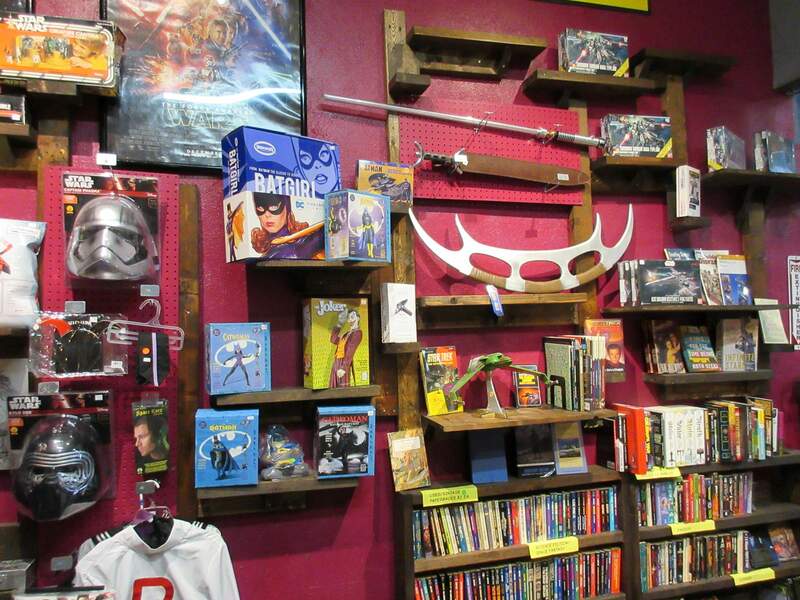 In addition to comic books and graphic novels, Farmington’s Tales of tomorrow sells props and cosplay supplies, used books, toys, model kits and LPs. FARMINGTON – Stepping into Farmington’s Tales of Tomorrow is like traveling to another era. In fact, upon entering the store, the first sound a customer hears is the door-swoosh sound effect of the U.S.S. Enterprise. The comic book shop opened on Small Business Saturday, Nov. 25 of last year, making it one of the only stores of its kind in the Four Corners in recent years. Clark is passionate about comics as a medium for storytelling. “It’s still a powerful medium,” he said. “There’s a reason that it’s hot right now in cinemas and on television, but I assure people the source material will leave an even more significant mark inside you than a movie. The comics that we’ve read and reread still speak to us. “As you change as a reader, revisiting material you see things – I read ‘Watchmen’ every five years, and it’s a different experience every single time, just because I’m a different person,” Clark said. When it comes to comic book titles, Tales of Tomorrow has the expected mainstream comics by publishers such as Marvel and DC, but it also has indie and self-published comics the likes of which would be difficult to find anywhere else. For instance, the shop sells “The Sixth World,” written and illustrated by Durangoan and Fort Lewis College graduate Kayla Shaggy. The sci-fi comic is about a Navajo girl who fights giant insects and the like on Mars. Clark also plans to create comics in-house. 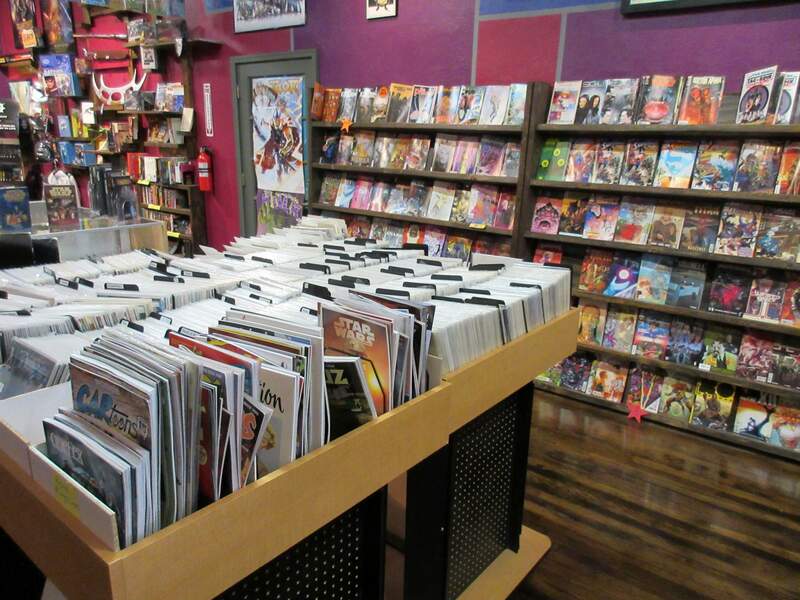 In addition to monthly comics – a new batch hits the shelves every Wednesday – the store sells trade paperbacks and graphic novels, manga, cosplay materials and how-to books, model kits, toys, used books and LPs . Cosmic CaféThe comic book shop, is only half of the business. Sharing a wall and taking up a similar amount of space, is the Cosmic Café, a sci-fi themed café run by Ren Harris. Harris hopes to have the café up and running by late July or early August. Tales of Tomorrow Vol. 2The comic shop’s business is trending upward, and after just six months, it is approaching a break-even point, Clark said. “I think that is not easy for a specialty store in this economy, but it does sort of demonstrate that we are serving a need – that there’s an underserved niche in the Four Corners. We have customers as far as Utah,” he said. Is there a chance that Tales of Tomorrow may expand across the state line into another town with no comic book shop? Clark and Harris both see it as a possibility. “I’m a firm believer that if you want something and it doesn’t exist, you should make it,” he said. Where: 220 W. Main St., Farmington. Hours: 10 a.m.-7 p.m. Monday, Tuesday, Thursday; 8:30 a.m.-8:30 p.m. Wednesday; 11 a.m.-9:30 p.m. Friday; 11 a.m.-10:30 p.m. Saturday; 2-9 p.m. Sunday. More information: Call (505) 324-0222.